Zinc Iron Plating was developed in the 1980’s as an alternative to cadmium. The process produces deposits containing 0.5-1.0% iron with the balance being zinc. Zinc Iron deposits provide enhanced corrosion protection, weldability, and good ductility. 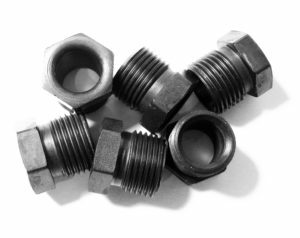 Zinc Iron Plating chemistries can be adjusted to improve adhesion of electroplating on formed steel components. Chromate conversion coatings, post treatment sealers or electrodeposition paints can be added to increase the longevity of the finish. Zinc Iron is most commonly selected when increased corrosion protection is required and a black appearance is desired. The process is capable of producing a near perfect black finish without the need for silver-based chromates. Zinc Iron Plating is an economical and environmentally friendly option for achieving extended corrosion protection. It provides uniform deposits with excellent part aesthetics. The coating is deposited utilizing an alkaline (non-cyanide) electrolyte, making it particularly well-suited for use on tubular components. Examples: fuel rails, cooling pipes, control arms, knuckles, mounting brackets, and fasteners.